On July 9, 1976, a twin-engine Piper Apache with a lone pilot aboard took off from Green State Airport in Warwick, Rhode Island, bound for Plainville, Connecticut. The purpose of the flight was to ferry the aircraft to Plainville for repairs. While in-route, one of the engines lost power and began sputtering. The pilot looked for a place to make an emergency landing and saw an open pasture surrounded by woods. The plane came in and clipped the tops of some trees at the edge of the field before crashing into the field and leaving a furrow 150 feet long before coming to rest. There was no fire after the crash, and the pilot was transported to a hospital for serious injuries. The field where the crash took place was known (at the time) as North Field, located about one mile west of Route 102, within view of Sisson Road. Providence Journal Bulletin, “Plane Crash Lands In Coventry Field; Lone Pilot Injured”, July 10, 1976, Page 7, with photo of crash scene. 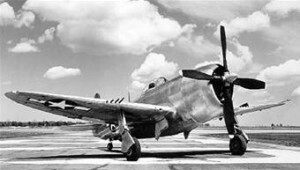 On the afternoon of June 25, 1944, a flight of three P-47 aircraft took off from Bradley Field in Windsor Locks, Connecticut, for a low altitude, cross-country navigational training flight to Hillsgrove Army Air Field in Warwick, Rhode Island. (Today Hillsgrove Field is known as T. F. Green Airport.) From Hillsgrove, the flight was to continue to Groton, Connecticut, and from there back to Bradley Field. The flight leader was First Lieutenant William H. Brookman, (27), an experienced pilot and flight instructor. The other two pilots were trainees. During the first leg of the trip, Lt. Brookman supervised the other two pilots from the number 3 position. As the flight neared the Connecticut – Rhode Island state border, it ran into thick cloud cover. At that time Lt. Brookman ordered the flight to return to Bradley. After turning around, the other two pilots noticed that Lt. Brookman’s aircraft, a P-47D, (Ser. No. 42-27835), had disappeared from the formation. Attempts to contact Brookman by radio were unsuccessful. The other two aircraft made it safely back to Bradley and reported the incident. Lt. Brookman was reported missing, but no reports of a plane crash had been received, nor had he radioed to the other pilots that he was having any problems with the aircraft. The wreckage of his P-47 was spotted from the air during a search the following day. His plane had crashed and burned in a heavily wooded area in the western portion of the town of Coventry, Rhode Island, just a short distance to the west of Pig Hill Road. The exact location is unknown. Military investigators were unable to determine the direct cause of the accident due to the airplane being completely destroyed. However, the following excerpt is taken from the Army Air Force investigation report of the incident. “The aircraft and engine were completely demolished, and the aircraft crashed approximately two and one half miles from the nearest house, thus, no person was found who had heard or seen the airplane. The carburetor is the only evidence found that gives any clue to the probable cause and it was broken from the engine. The bolt holding the fuel strainer was loose and could be turned slightly by hand. The gasket was in good condition. The seat under the strainer cover shows signs of burning which leads one to believe that gasoline did escape at this point and caused a fire in flight prior to the airplane’s contact with the terrain. Picture 231 indicates a crack as well as picture 230 but these are only marks. Although only the fuel strainer side of the carburetor was burned, it is possible that it could have caught fire as a result of the terrific impact and been covered with raw fuel during the crash, burning until it landed several yards from the engine as the grass upon which the carburetor was found was not burned. Lt. Brookman enlisted in the Army Air Corps in January of 1942, and received his officers commission the following October. He was assigned to the 9th Air Force, and served in North Africa until the German surrender in June of 1943. He then returned to the United States to become a flight instructor, and after completing training in Stuttgart, Alabama, was assigned to Bradley Field in Connecticut. Lt. Brookman is buried in Woodlawn – Hillcrest Cemetery in Omaha, Nebraska. To see a photo of him, go to www.findagrave.com, see ID# 75022710. Town of Coventry R.I. Death Records, Registration #61, page 299. Book, “Fatal Army Air Forces Aviation Accidents In The Unites States, 1941-1945”, by Anthony Mireles, McFarland & Co., 2006, via research library, New England Air Museum, Windsor Locks, Ct.